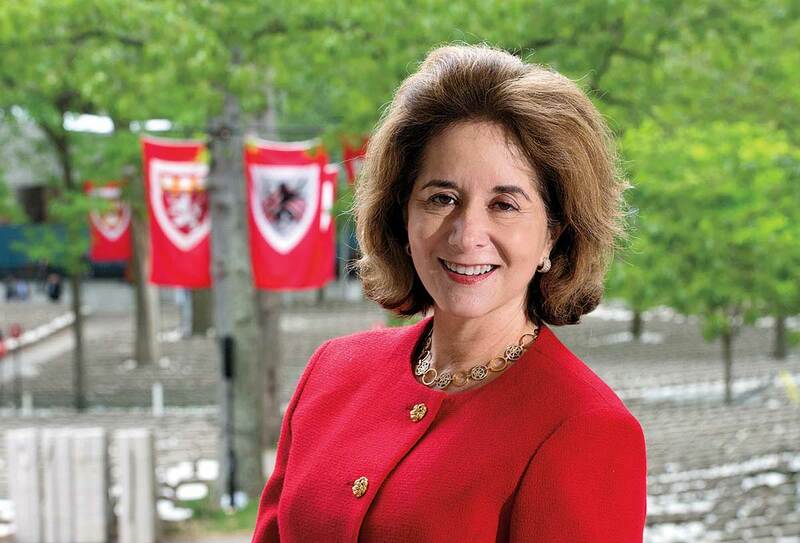 Torres, who takes office during the University’s $6.5-billion capital campaign, is a longtime alumni leader. An admissions interviewer for more than 30 years, she has also led numerous HAA committees and task forces and is a past president of the Harvard Club of Southern California and a former secretary of the Harvard Club of Hong Kong. Most recently, she led the HAA’s review of Shared Interest Groups (SIGs), and also established ways for alumni to teach and mentor students during Harvard’s Wintersession. In May, during the traditional HAA presidential Class Day speech to graduating seniors—a group including her older son, Spencer Gisser ’14 (see Commencement Confetti, July-August, page 17)—Torres noted that she has “volunteered for Harvard every year in every city I have lived in—and I have moved a lot. Whenever I moved someplace new, I would contact the local Harvard club and ask how I could help.” (A global couple, Torres and her husband, Michael V. Gisser ’77, a senior mergers and acquisitions partner at Skadden, Arps, Slate, Meagher & Flom, now split their time among Los Angeles, Hong Kong, and New York City.) As a freshman, however, Torres was much less sure she’d find any niche at Harvard, and not only because she had never lived with snow. “My father grew up in poverty as a Mexican-American migrant farm worker, and my mother was a homemaker raising four children on a tight budget,” Torres told the crowd gathered in Tercentenary Theatre. Her years at Harvard were “transformational,” the government concentrator added, and her continuing involvement with the University has continued to teach her about the world. As first vice president of the HAA last year, Torres traveled to Bulgaria, Chile, and Australia to meet with alumni; she expects to spread the word about Harvard as “an open and welcoming place” this year across the country and abroad. “I’ve been able to see the power of the Harvard network,” she said during a recent interview, “and it’s truly extraordinary to see people turn out because the University means so much to them.” As president this year, she plans to sustain the HAA’s mission to help alumni “engage and connect” with the University, and is working with the HAA to develop alumni leaders among Harvard clubs, SIGs, reunion classes, and younger graduates, especially those using social media. Her years in finance, including investment banking at Goldman, Sachs & Co., institutional business development at Fidelity Investments, and marketing and client services at Diamond Portfolio Advisors, provide valuable skills toward these ends.